Unique design and lots of action. 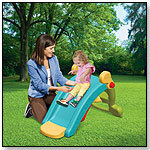 Qwikflip(R) design allows the 32" slide to easily convert to a rocker. Sure-grip handle, extra wide base and texture steps to ensure stability. Launch date: December 2012.